Genuine leather sheath with Case logo. No. 09026 - Fits all medium size case folding knives. No. 09027 - Fits all large size case folding knives. Made in the USA. Genuine leather sheath with Case logo. No. 09026 - Fits all medium size case folding knives. No. 09027 - Fits all large size case folding knives. Made in the USA. These blades fit all AccuSharp products except ShearSharp? Sharp N Easy. These blades are reversible to double the life of AccuSharp Sharpeners and are made of the highest quality American made Diamond-honed tungsten carbide. Brown celluloid handle with stainless steel blades. Specially designed ``V" shaped cutting head with 2 crossed carbide blades. Reversible cutting heads for twice the life. Scissors sharpener features a floating round sharpening rod that conforms to the exact scissors angle. Includes sharpening instructions. Two pull through sharpening slots (coarse and fine) for standard edges and a diamond-coated, tapered rod for sharpening serrations and gut hooks. Use for sharpening extremely dull or damaged blades and for everyday maintenance. Abrasive components are replaceable. Lanyard hole for carrying. Rust proof and has a tungsten carbide sharpener that is reversible. Sharpens scissors, pruning shears, tin snips, hedge clippers and similar tools. Lightweight and strong. Spring lock for easy press and release blade replacement. Replaceable utility blade (contractor or standard grade). Anodized aluminum handle. Pocket clip for easy carry. Blue rubber handle. Rust proof and has tungsten carbide sharpeners, one of the hardest materials known. Sharpeners are reversible, replaceable and recessed for safety. Easily stored in kitchen drawer, pocket, tackle/tool boxes. AsGround Tru-Sharp surgical steel locking drop point blade. Rust resistant and polished honed blade holds a keen edge. Back spring lock release. Lanyard hole. Lightweight Zytel handle material, exceptionally tough. Made in the USA. Features a small blade, scissors, nail file with screwdriper tip, toothpick, tweezers and key ring. 2-1/4'' closed. Features a small blade, scissors, nail file with screwdriper tip, toothpick, tweezers and key ring. 2-1/4'' closed. Features a small blade, scissors, nail file with screwdriper tip, toothpick, tweezers and key ring. 2-1/4'' closed. Delrin handle with stainless steel liner lock blade. Delrin handle with stainless steel blade. Features a small blade, scissors, nail file with screwdriper tip, toothpick, tweezers and key ring. 2-1/4'' closed. An unbreakable diamond-coated steel rod used to sharpen all kinds of knives, including serrated edges. The retractable rod is engineered with a cone shaped end for use on serrations and tight spaces. The diamond-coated steel rod also has sharpening grooves for use with all kinds of hooks, darts and pointed objects and comes complete with a shirt pocket clip for easy storage. This Cross-Cut multi-tool is equipped for cutting, gripping, personal care and the unexpected. Lightweight and compact for easy carrying. 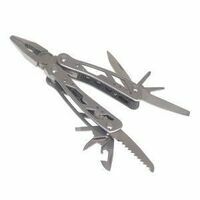 420 stainless steel multi-tool with a satin finish. Packed with 10 essential tools and comes with a leather sheath for added portability. Compound Leverage doubles cutting power. Tools include: spring-loaded scissors, a knife blade, small and medium flat screwdrivers, a set of tweezers, a nail/cleaner, bottle opener, pick, ruler and a lanyard loop. Lightweight, versatile and convenient. Combines the strength and control of a fixed blade with the portability of a folding knife. Durable and easy to handle. Drop point blade. Black zytel handle. Lanyard hole. In Clam Pack. Made in the USA. Trustworthy and durable. Easy to handle, compact size. Small Camo Lockback Stainless steel spear blade. Made in the USA. Natural soft (Washita) oilstone. Storage/carrying case included. Size 5-3/8" x 1-5/8" x 1/4". Made in the USA. Lightweight Zytel handle. Polished-honed blade edges. AsGround Tru-Sharp surgical steel drop point blade. Back-spring lock release. Lanyard hole. Made in the USA. Dual-sided pocket sharpening stone featuring a 320 grit coarse Diamond surface used for more aggressive sharpening, plus an 800 grit fine diamond surface used for honing and finishing. Also has a groove used for sharpening all kinds of hooks and darts. The pocket stone comes complete with a handy carrying pouch with a built-in belt loop for convenience. Small lockback. Easy to handle, compact size, lightweight, versatile and convenient. Combines the strength and control of a fixed blade with the portability of a folding knife. Stainless steel locking clip blade. Black Zytel handle. Made in the USA. Surgical stainless steel blade (3-1/8"). Wood inlays with brass bolsters. Blade etched "Winchester". This handy pocket tool is small in size, not in function. With a convenient butterfly open design and 8 useful components, this keychain ready mini tool is never too far out of reach. It's a bottle opener with about 9 other tools like the new splice scissors which gives you more than cutting capabilities thanks to a variety of handy tools. Stainless steel black. It's a bottle opener with about nine other tools. The pocket-sized pliers pack multiple functions into a tiny package that fits on a keychain. The vise gives you more than plier capabilities thanks to a variety of handy tools. Stainless steel black. Weighs 2 oz. Features a large blade, small blade, can opener with small screwdriver, bottle opener with large screwdriver and stripper, toothpick, tweezers and key ring. Rose wood handle with stainless steel lock back blade. Frame lock design. Fine edge that is lightweight with a simple open frame that allows blade to open effortlessly. Built with a smooth stainless steel handle and a clip for secure travel. Sturdy pocket clip. The clip point blade is high carbon stainless. Lighter that a set of car keys at just 1.5 oz. Fine edge 2.13" blade and tanto point are small but remain effective for a wide array of daily needs, from slicing through stubborn rope to opening a cardboard box. Easy to sharpen. Pocket clip offers security and keeps your knife within easy reach at all times. Black titanium nitride-coated blade reduces unwanted reflection and defends against corrosion. Frame lock offers bomber blade control. Small size disappears in your pocket. The multi function comes from locking implements including screw drivers, a blade and file. Can open beers and be clipped to just about anything with the built in carabineer clip. Keychain compatible, stylish, lightweight and strong. Blue stainless steel. Stainless steel drop point 3.35" blade. Cut-out handle design with steel handle liners. Thumb stud for one handed opening and liner lock. Convenient belt clip to keep knife handy. With highly visual orange handles and a design aimed for comfort, these efficient serrated shears are built to break down small game. Release the pivot pin, separate the two blades and cleanup is a breeze. For the hunt, for the kitchen, keep 'em on hand. Weighs 4.6 oz. Staglon handle with stainless steel blade. Delrin handle with stainless steel blade. Coarse and Fine Diamond stones in one compact unit. Includes 4" x 1" coarse stone (yellow), 4" x 1" fine diamond stone (orange), soft grip rubber handle (stones store in handle), thumb guard, hook and tool sharpening groove, and micro-tool sharpening pad. Coarse and fine grit sharpening stones feature multiple layers of micron-sized monocrystalline diamonds and a unique sharpening surface with an overlapping hole design. This design speeds sharpening by collecting and holding the metal filings which ordinarily build up during the sharpening process. Each stone has a "Micro Tool Sharpening Pad" and a sharpening groove for fishhooks or tools. Soft grip rubber handle is designed to make sharpening safe and easy. Stones can be stored in the handle for safe keeping. Delrin handle with stainless steel lock back blade. In about 10 seconds, sharpen knives (even serrated knives), cleavers, axes, machetes and many other cutting tools. Easily stored in drawers, pocket and tackle/tool boxes. The Exchange-A-Blade pocket knife uses contractor grade or standard size utility blades that can easily be replaced. Also features deep finger grooves that provide a secure grip in a lighter knife. Stainless steel handle doubles as a pocket or money clip. Pocket knife uses contractor grade or standard size utility blades that can be easily replaced as necessary. Stainless steel handle. Liner lock construction keeps the blade safely in the open position when in use. The blade screw is raised for easy opening. Nail nick for easy opening. Pocket clip doubles as a money clip. Combines every sharpening necessity into one pocket-sized unit. Features coarse tungsten carbide sharpening blades and fine ceramic rods. The unit also comes with a retractable diamond-tapered rod used for deep serrations. The rod also has a groove for all of your hooks and darts. Plus, the unit comes with a retractable flat diamond file for users who prefer a continuous surface for their sharpening needs. The model is finished off with molded rubber feet to keep the unit steady while in use. Ready at a moment's notice, the highly visual orange case is easy to locate and operate on the fly. There are 12 replacement blades in the cavity, safely extracted without worry of reaching into a bag for a loose blade. The waste compartment keeps used blades in one place. Blades fit the Vital Folding Pocket Knife (9368705). Delrin handle with stainless steel blades. Delrin handle with stainless steel blades. Delrin handle with stainless steel blades. Delrin handle with stainless steel liner lock blade. Built-in LED light, click for constant on. 400 series stainless steel. Sure grip handle. Spring loaded pliers head. Includes LED light in handle, pliers, knife blade, saw blade, wire cutter, Phillips screwdriver, bottle opener, wire stripper, awl, file with nail pick, can opener with small flathead screwdriver tip and key ring. Includes 2 CR927 batteries. Sure grip textured nylon handle sides. Locking liner. Ambidextrous thumb stud. Spring assisted blade opening. Pocket clip on back helps knife fit snug in your pocket. 3" blade. Stanley Multi Tool, 12 Tools, Includes: Long Nose Pliers, Wire Cutter, Saw, Standard Screwdriver (1/4 in), Small Knife, . Bottle Opener, Curve Jaw Pliers, Standard Screwdriver (5/16 in), File, Large Knife, Phillips Screwdriver and Standard Screwdriver (1/8 in), 4-1/4 in Closed Length, Stainless Steel Constructed of anodized aluminum and stainless steel. Rust free. Wheel lock gives you the ability to open and close knife with only one hand. Belt clip for convenient attachment to pants. Rose wood handle with stainless steel lock back blade. Multi-tool includes Pliers, wire cutter, fine edge blade, scissors, medium flathead driver, crosshead driver, bottle opener, tweezers, file and a retail package opener. Dime includes a unique blade designed to safely cut and score plastic packaging and a bottle opener that is exposed even the tool is closed. Compact and lightweight. Ideal for sharpening and maintaining your blades. Heavy duty, ergonomically designed handle with rubber over-molded grip provides a stable and comfortable platform for sharpening all your knives. Commercial grade knife sharpener. Contains diamond-honed tungsten carbide sharpening blades for coarse sharpening and ceramic rods for fine honing and polishing. A highly visible orange handle featuring intuitive finger grooves, this unique blade with adjoining gut hook affords the user unparalled ease in dressing big game, saving body strain and time. The handle is glass-filled polymer with rubber over-mold. The Vital Skin & Gut Knife possesses ideal edge retention and is easy to hold in navigating the awkward contours of large game thanks to its unique round expansion along the belly of the blade. Then knife is equipped with a gut hook tip to maximize its competence in capping when the user's arm reaches an exhaustion point. Its grippy rubber handle provides a brawny push and pull strength to maximize time and energy employed in skinning and field dressing. The Dime is a mini multi-tool with 12 useful tools and suspends neatly from a keychain. Smooth butterfly opening and comfortable ergonomic handles to manage obstacles. Store it in a pocket, a backpack or keep it on a key ring. Tools include: Spring loaded needle nose pliers, standard pliers, tweezers, wire cutter, bottle opener, fine edge blade, retail package opener, scissors, medium flat head driver, coarse and fine file, cross driver and Lanyard ring. Delrin handle with stainless steel blade. Delrin handle with stainless steel fixed blade. Includes leather sheath. Manufactured Aluminum oxide oilstone packaged in storage box. 5-3/8" x 1-3/8" x 3/8". Made in the USA. Features a large blade, small blade, can opener with small screwdriver, bottle opener with large screwdriver and wire stripper, reamer with sewing eye , phillips screwdriver, toothpick, tweezers and key ring. Dual thumb stud for easy one hand opening. Sturdy pocket clip. Super lightweight, streamlined design. Folding pocket knife with one hand operation. Genuine jigged bone handle with polished nickel brass bolsters. Made from 420a stainless steel. Strong, corrosion resistant stainless steel blades. This unique tool saws easily through the bones of big game animals in comfort. The highly visual orange handle is rubberized and designed to fit in your hand securely while sawing. Serrations are set to optimize efficiency and body strain. Delrin handle with stainless steel blades. Delrin handle with stainless steel blades. Desert ironwood handle with stainless steel blades. Delrin handle. Stainless steel blade. Stainless steel 3.5" blade. Matte finish stainless standard edge drop point blade with dual thumb studs. Checkered black G-10 handles. Reversible black finish stainless pocket clip. Lanyard hole. Features double lock blade locking system for added safety. Elegant steel composes the ultra-lightweight handle of this little knife. Weighs only 1.5 oz. Stainless steel fine edge blade (2.6") within a small, yet solid frame lock construction. The half-arc grooves stamped into the lower edges on each side of the handle with thumb and index finger while deploying the knife one-handed using the thumb hole in the blade. Frame locking prevents the blade from closure during use for safety. Fine edge blade allows for rapid and easy sharpening, regardless of location. A small lanyard hole provides optional tie-down and additional security for this reliable knife. The US1 is an American made folding knife. The 420HC steel fine edge blade is deployed with a simple nail nick and held in check by an easy to operate back design. The handle is 30 percent glass filled nylon with rubber over-mold. The slim profile fits perfectly in your pocket. The lock-back structure keeps the knife safely open while in use. Proudly made in Portland, Oregon. Delrin handle with stainless steel fixed blade. Includes leather sheath. Overall length with handle: 7-1/4''. Built as tough as the Gator machete, the Junior is shorter and more packable. The two-sided 10.75" blade has both a fine edge for hacking brush and vines and a rough cut saw edge for cutting branches, limbs and small trees. It's a high-carbon steel shaft with a tactile rubber grip gator handle. High carbon steel head. 3.9" stainless steel blade. Sturdy construction with spring assist. Pocket clip on back helps knife fit snug in your pocket. Handle material: Fiberglass-filled textured nylon. Drop point lock blade with brushed stainless steel handle. Made in the USA. Staglon handle with stainless steel blades. Staglon handle. Stainless steel blades. Delrin handle with stainless steel blade. Includes leather sheath. Staglon handle with stainless steel blades. Delrin handle with stainless steel blades. Delrin handle with stainless steel blades. Staglon handle. Stainless steel blades. The Gator machete has a 15" fine edge blade on one side and an 18" high performance saw blade on the other. It's forged of high carbon stainless steel. The handle is covered with a gator grip rubberized handle for comfort and control. Riveted, nylon sheath included for secure carry. Made for use in the wilderness, as well as the backyard. It's a dual purpose, lightweight machete for beating back the underbrush and trailblazing. Desert ironwood handle with stainless steel blade. AsGround Tru-Sharp surgical steel skinner blade with etching. Smooth jet-black synthetic handles. Made in the USA. Desert ironwood handle with stainless steel blade. Flexible, AsGround Tru-Sharp surgical steel blade. Genuine leather sheath with tough plastic liner. Lightweight, rugged synthetic handle, ergonomically designed for comfortable use in either direction. Made in the USA. Smooth, yellow synthetic handle. Skinner blade stamped from chrome vanadium steel, a special formula of carbon steel, easy to resharpen. Made in the USA. Staglon handle. Stainless steel blades. Rose wood handle with stainless steel lock back blade. Includes leather sheath. An extremely capable knife, the mini F.A.S.T. draw blends the excitement of our original design in to a compact package that fits ideally in any pocket. It has a textured handle with integrated safety and lock release, along with a strong high carbon stainless steel blade. A reversed pocket clip makes it easy to carry and ready to spring into action. One handed opening. Blade is released by a strategically placed side button. Lightweight, open frame knife with a serrated locking blade. Opens effortlessly. Built with a smooth stainless steel handle and a sturdy pocket clip for secure travel. Easy to clean. Frame-lock handle design. Clip point blade style. High carbon stainless blade. The Moment large fixed blade gut hook knife with a 3.63" fine edge drop point blade to handle tasks big or small. Full tang construction and ergonomic grip means this knife can rise to the challenge of long term use. Glass bead blade finish for low reflectivity and fewer fingerprints. Textured rubber over mold handle with nylon core feels great and delivers secure all-conditions confidence in your group. Nylon scabbard with metal snaps keeps your knife within easy reach and securely stowed. Balanced feel and comfortable grip. Gut hook on the blade tip makes processing your game quick and efficient. Tanto-style 2.88" blade easily fits in the palm of your hand and is ready to puncture, slice and perform detailed work. Partially serrated edge adds utility when dealing with stubborn materials like nylon rope. Pocket clip offers security and keeps your knife within easy reach at all times. Black titanium nitride-coated blade reduces unwanted reflection and defends against corrosion. Frame lock offers bomber blade control. Thumb studs facilitate quick, easy blade engagement. Staglon handle with stainless steel blades. Brushed stainless steel handle. Locking drop point blade. Made in the USA. Staglon handle with stainless steel blade. Features a large blade, small blade, can opener with small screwdriver, bottle opener with large screwdriver and wire stripper, wood saw, reamer with sewing eye, corkscrew, toothpick, tweezers and key ring. The versatility and ease of carrying a full size knife. Fully capable of undertaking field dressing and the diverse needs of a hunting trip. The Moment large sheath folding knife is suitable for all tasks big and small. Nylon sheath with metal snaps keeps your knife within easy reach and securely stowed. From skinning to quartering, the 3.5" fine edge blade is designed for smooth engagement and firm cutting, while the molded rubber handle is designed for maximum comfort and a confident grip. Secure liner lock for in-pack or on-belt carry. Pommel with lanyard hole adds utility. Glass bead blade finish for low reflectivity and fewer fingerprints. Textured rubber handle feels great and delivers secure all-conditions confidence in your grip. 3.9" stainless steel blade. Sturdy construction with spring assist. Pocket clip on back helps knife fit snug in your pocket. Handle material: Fiberglass-filled textured nylon. Rose wood handle with stainless steel lock back blade. Includes leather sheath. AsGround Tru-Sharp surgical steel skinner blade with etching. Smooth jet-black synthetic handles. Made in the USA. Delrin handle with liner lock stainless steel blades. Includes leather sheath. Includes fixed pick and tweezers. Staglon handle with stainless steel fixed blade. Includes leather sheath. Interrupted surface speeds sharpening. Fine 750 grit surface. Multiple layers of micron-sized diamonds bonded in nickel to a flat metal surface. Oval shaped holes in surface for easy discharge of fine metal filings and reduced build up. Sturdy molded plastic base with non-slip rubber feet for better stability. Includes protective lid and sharpening instructions. Desert ironwood handle with stainless steel fixed blade. Includes leather sheath. This crafting tool provides functionality of a field-proven, full tang fixed blade knife, plus the added versatility of nearly 4' of paracord. Weighs under 6 oz. The minimalist, balanced feel of the fixed blade is well suited to extended back country travel where every ounce counts. Performs equally well with or without the paracord and offers a full grip for all hand sizes. Has plenty of power for driving the blade to shape wood or work on small game. A deep coil that sits between your hand and the blade allows you to safely apply added pressure when driving the blade and a textured thumb rest on the spine adds control. AsGround Tru-Sharp surgical steel clip and pen blades that hold an edge and resist rust. Jigged brown high-impact synthetic handle. Polished-honed edges for superior sharpness. Made in the USA. AsGround Tru-Sharp surgical steel clip blade. Slim and sturdy, jigged brown synthetic handle. Made in the USA. AsGround Tru-Sharp surgical steel clip and pen blades resist rust and hold an edge. Jigged brown synthetic handle. Made in the USA. 3 sharpening stones in one. Features a coarse synthetic stone, medium synthetic stone and a natural Arkansas stone. All 3 stones are mounted on a plastic, triangle base with a handle on each end for easy stone rotation and stone labels for easy recognition. The sturdy base holder has non-skid feet and a trough to catch excess oil drippings. Base will not get oil soaked and is easy to clean. Includes 1oz. bottle of honing solution and a angle guide. Smooth, yellow synthetic handle clip blade. Blade stamped from chrome vanadium steel, a special formula of carbon steel, easy to resharpen. Made in the USA. Versatile and easy to use. Stainless serrated blade. With a rugged polycarbonate handle that also has SoftGrip inserts, this handle offers superior grip. One hand opening quickly and easily deploys the blade with a well placed cut-out, as the name suggests. Lock back mechanism provides structural integrity for heavy-duty work. Yellow synthetic handle, clip and pen Chrome Vandium blades. Made in the USA. Features a large blade, small blade, can opener with small screwdriver, bottle opener with large screwdriver and wire stripper, scissors, reamer with sewing eye, corkscrew, hook, toothpick, tweezers and key ring. With 2 built-in LED lights to illuminate work surfaces, the multi-tool is ideal for working on the car, under the sink or other tight spaces where light is needed. Sure grip rubber handle inlays provide a firm and comfortable grip. Stainless steel construction ensures that this tool will provide years of worry free use. Spring loaded pliers head for easy one handed operation. Includes scissors, bottle cap lifter, small and medium slotted screwdriver tips and Phillips screwdriver tip. LEDs take two CR1616 batteries (included). AsGround Tru-Sharp surgical steel clip, sheepfoot and pen blades. Brown synthetic handle. Made in the USA. For people who want a serious blade, yet compact, foldable and able to fit neatly into a sheath, on a belt and out of the way. 1/2 serrated high carbon stainless steel drop point blade. Ideal for edge retention and cutting rope. Lock back locks blade securely in place and maximizes safety during closing. Dual-sided thumb stud for easy single-hand opening. Ergonomic textured rubber grip maximizes comfort and reduces slippage. The nylon sheath is lightweight, military grade, mildew resistant sheath allows for horizontal or vertical carry. Includes a Priorities of Survival pocket guide containing Bear's survival essentials. AsGround Tru-Sharp surgical steel clip and pen blades that hold an edge and resist rust. Polished honed edges for superior sharpness. Smooth jet-black high impact synthetic handle. Made in the USA. Smooth yellow synthetic handle. Mirror polished chrome vanadium clip and pen blades; easy to resharpen. Made in the USA. The Suspension is an open frame multi-tool. Saf.T.Plus locking system. Components include spring loaded needle nose pliers, wire cutter, fine edge knife, serrated edge knife, saw, scissors, cross point screwdriver, small and medium flat blade screwdrivers, can opener, bottle opener and lanyard hole. All housed in a ballistic nylon sheath and it's lightweight. Titanium gray stainless steel handle. Featuring a safe Exchange-A-Blade option, a surgically sharp blade cuts through game easily, requiring no extra tool if you need to replace the blade on the fly. The orange handle is easily spotted of you should drop it while out in the field. Large finger choil and larger width gives it a solid, comfortable grip. A smart mash-up a replaceable utility blade with the high visual orange rubber handle that won't quit, this knife travels to the field and on the hunt with ease. To order the Replacement Blade (9368721). Stainless steel 3.5" blade. Matte finish stainless standard edge drop point blade with dual thumb studs. Checkered black G-10 handles. Reversible black finish stainless pocket clip. Lanyard hole. Features double lock blade locking system for added safety. Ergonomically designed. Comfortable hand position and sure cutting grip. One-piece molded black Zytel handle, AsGround Tru-Sharp stainless steel 4-1/8" swept skinner blade. Black Balistic Nylon sheath, will not hold odors; the same material specified by the U. S. Government for pistol holders. Made in the USA. Mirror polished Chrome Vanadium clip and spey blades. Smooth yellow synthetic handle. Easy to sharpen. Ideal for any task. Made in the USA. Smooth yellow synthetic handle. Mirror polished, chrome Vanadium sheepfoot, spey and clip blades; easy to sharpen. Polished-honed edges for a keen edge. Made in the USA. The F.A.S.T. Draw relies on a proprietary new blade opening concept; forward action spring technology that's so lightning-quick and so pleasingly easy to open with just one hand. Drop point blade with 2.0 assisted opening. High Carbon stainless blade material. Glass filled nylon handle. Tiny in stature, but big on ability. Suited to smaller hands or for those who like a tool that's virtually weightless (1.3 oz). A reliable daily carry knife opens fast and easily and sits comfortably in your hand. For added safety, the thumb Plunge Lock on the handle means easy closing, without putting your fingers in the blade's path. Open frame design strips weight out, while adding texture to the body for increased hold. Grippy without feeling stick, the Outrigger is finished with a molded rubberized handle to better keep the knife in your hand. Fine edge drop point blade for smooth, accurate cutting. Dual thumb studs for quick, secure opening. It's a knife first, with multi-functional implements second. The Obsidian clip knife features a high grade blade with dual thumb studs for one handed opening and a safety style lock that ensures the blade stays open or closed when you need it to. Lanyard hole. Includes Cross head and flat head drivers, file and bottle opener. Swagger offers the ease of use, stout construction and comfortable carry with a 3.25" blade and assisted opening convenience. Reliable plunge lock secures blade when in use. Black titanium nitride-coated blade reduces unwanted reflection and defends against corrosion. G-10 composite handle with textured scales provide secure grip and slim profile. Thumb studs facilitate one-handed operation. Utilitarian pocket clip keeps the Swagger secure and handy on your belt or in your pocket. The EVO is a lightweight, straight-spined clip folder. Designed with a series of seven slanting oval openings in the anodized aluminum handle. Finger flip opening. Titanium nitrade-coated 3.43" blade. Liner lock. Rubber textured gator grip handle for ideal comfort and control. Beneath that tactile rubber surface is a virtually indestructible glass-filled nylon handle. Inside that handle is a hollow area containing a magnet that can hold a knife. The axe head is engineered from forged steel. 7.01" overall length of knife with 2.88" blade. AsGround Tru-Sharp surgical steel sheepfoot, clip and pen blades. Brown synthetic handle. Made in the USA. Constructed with Case Tru-Sharp stainless steel which is a special high-carbon steel that helps the blade hold an edge longer that conventional steel. It also offers extraordinary blade strength and corrosion resistance. Features a long clip blade and has a small design that fits well into pockets or purses. The clip blade is commonly used as a multi-purpose blade and preferred for detail work. Roger's corn cob jigged blue bone handle. Comes conveniently packaged in a box. Made in the USA. AsGround Tru-Sharp surgical steel clip, spey and pen blades. Polished honed edges for superior sharpness. Jigged brown synthetic handle. Made in the USA. Amber bone jigged handle. Clip and pen stainless steel blades. Made in the USA. Clip and pen stainless steel blades. Genuine blue bone handle. Made in the USA Features a one-handed serrated locking blade, bottle opener with large screwdriver and wire stripper, can opener with small screwdriver, phillips screwdriver, key ring, toothpick, tweezers, reamer and wood saw. This American made tactical folder is thoughtfully designed and lightweight for use over the long haul. A 420HC black ceramic coated blade, rubberized diamond texture handle, sturdy pocket clip and partially serrated blade ensure preparedness. Ceramic coating protects against corrosion and minimizes reflective surfaces. Handle material is rubber over-molded glass filled nylon providing a secure grip in all weather conditions. Use its pocket clip to attach it to a belt or a pocket for daily access. Tie the knife down using its lanyard hole for additional security. The thumb hole in the Order's blade allows for easy one handed opening and the lock back mechanism provides structural integrity for heavy-duty work. The Order is proudly made in Portland, Oregon.